Dorothy Pavey - watercolours of countryside and garden. Limited edtion art prints by watercolour artist. Dorothy Pavey lives and works in the beautiful Cotswold area of England. Having formerly been a teacher she began full time painting in 1994. 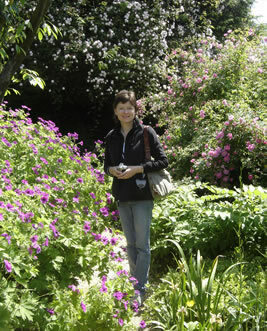 In 1999 she was elected a member of The Society of Botanical Artists and exhibits regularly with them in London. Most of her work she sells through solo exhibitions and she has a mailing list for those interested to attend. In addition visitors are most welcome to make private appointments to view original paintings at her home/studio. As a keen walker, gardener and photographer a lot of her material is gathered while out and about and she rarely goes anywhere without a camera to capture the fleeting moments and the detail of what will later become paintings. Dorothy hopes others will enjoy her expression of the beauty of the natural world.